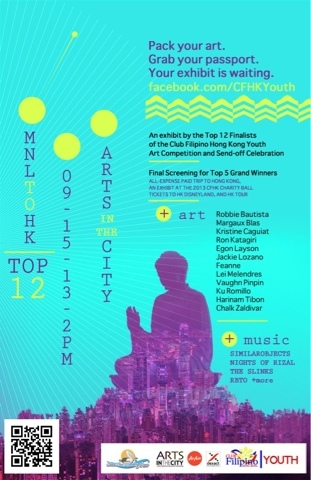 I was overwhelmed when I heard the news that I got in as part of the 12 Finalists in the 2013 Club Filipino Hong Kong Art Competition. It's the second art competition I joined into. Nothing to lose I thought, because whether to get in at the top 5 for a free Hong Kong trip and exhibit or not, I still get to have another group exhibit I can add on my portfolio. Mostly, I am honored to be lined up with great artists. Some are professional painters, art professors, graduates of some prestigious Universities; that got me really excited and intimidated, I should say. But just like my first, it was all for the experience if nothing else. I am glad to participate in such event and cannot wait to meet all the other artists who got in as well. I hope to see you at the opening on September 15, 2013 at 2:00 PM. The exhibit will run from the 15th till the 18th of September at The Arts in the City Gallery, near NBC Tent. @mike and @jjampong: thank you guys!